Realm: Yoro is a slum planet made up of large industrial complexes. The complexes have a primary purpose of refining precious minerals and gemstones for the neighbouring realm of Cergaron. The people are poor and many of the communities are governed by powerful crime warlords. Profile: A military enforcement officer. Former gang member. Personality: Reckless, self-destructive, hot-headed and unstable. 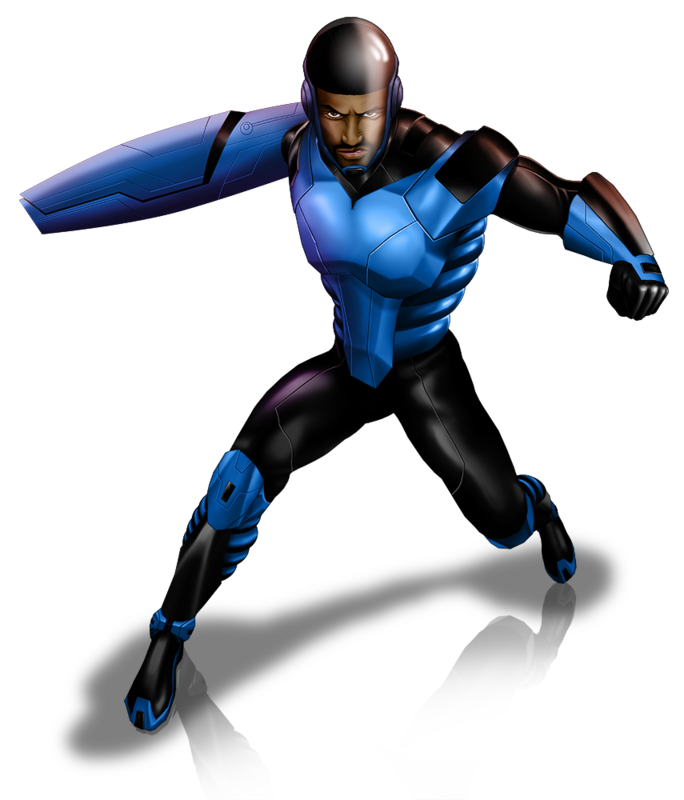 Abilities: Raymond has the ability to communicate with machinery as well as build solid holograms. Raymond grew up on the mean streets of Bagatelle a poverty-stricken slum of Yoro. Like most boys, Raymond joined a gang in his teens. The only way to survive was to be on the good side of the ruling warlord. Being in a gang guaranteed you food and protection. He had to spend years as a pledge. Doing simple jobs for the warlord. Until the time came for his initiation to become a full-fledged gang member. For his initiation, he was required to perform an armed robbery at a local corner store. He thought it would be a simple job. However, the job went sideways when the corner store owner recognized him. His fellow gang members decided that the shop owner had to die. Raymond refused and his fellow gang members turned on him. He was able to fight them off but the shop owner was mortally wounded in the process. Raymond was also wounded. Raymond was arrested. The arresting officer gave him a choice. He could either be charged with the crime and the murder of the shopkeeper, or he could enlist in the military and become an enforcement officer. He knew that he would be hunted by the gang so he would not survive in prison. He chose to become an enforcement officer. Raymond has a brother, Roger, who was also a member of the same gang. He rose through the ranks and eventually overthrew the leader to become the new warlord. It makes for interesting family reunions when Raymond and Roger get together. One an enforcement officer and the other a gang warlord.